Valentine's Day is coming up and this is the perfect top to wear for it! I am obsessed with the lace, and embroidered details on the bell sleeves! I also love anything with tassels, and this top also has them!! Throw on a pair of red skinny's and you will be set for a cute and casual outfit! And if you haven't already, you have to get these boots. They are my favorites and I wear them almost every day! I hope yall have a happy Friday! I started mine with no school today! So excited to catch up on my sleep! IT'S FRIDAYYY! Who's ready for the weekend?! This is one of my favorite outfits! It has so many of my favorite things put together. First, is the pleated tank. I seriously cannot get enough of pleats. I would wear them every day if I could. And this little pleated under-shirt is the best touch to a simple sweater! Second, are the ripped jeans. I tend to always want to wear black jeans with every outfit in the winter, so these ripped ones switch it up a bit! Third, are my leopard booties(insert heart face)!! When I saw these, I just had to have them. I am obsessed with leopard print and it goes with everything! Fourth, is a pop of red. I love to wear a neutral outfit with red accessories. It is such a timeless look! What are yall's plans for the weekend?..I'm currently snowed in and Lola(my puppy) loves it! Happy Wednesday! The weekend is getting closer!! I've searched high and low for the perfect brown faux fur vest, and I finally found it! This one is lightweight and not too bulky which is really what I was looking for. It also goes with anything! Throw it on with a plaid shirt, dress, or sweater and it immediately dresses your outfit up! This cable knit sweater is also a favorite of mine. I really wanted a white cable knit this season and it took forever to find a good over-sized one, but I managed to! Plus, it's on sale for $20! I hope everyone has a great start to the week! I know I am...no school today!! I found the cutest babydoll dress, yall! I cannot get over the print and all of the details. The crochet/lace detailing on the shoulder is to die for. It's probably my favorite thing about the dress! And did I mention how comfortable it is? I wore it all day long and didn't mind it one bit(that's saying a lot!). Also, it's only $34! Cute, comfy, and affordable?? Yes, please! Also, I didn't show a lot of detail on my booties, but they have fringe on them and I wear them all. the. time.! I had my first DH patient Tuesday and I was terrified! It went great though! And I passed, which is amazzzzing! Happy weekend, beauties! 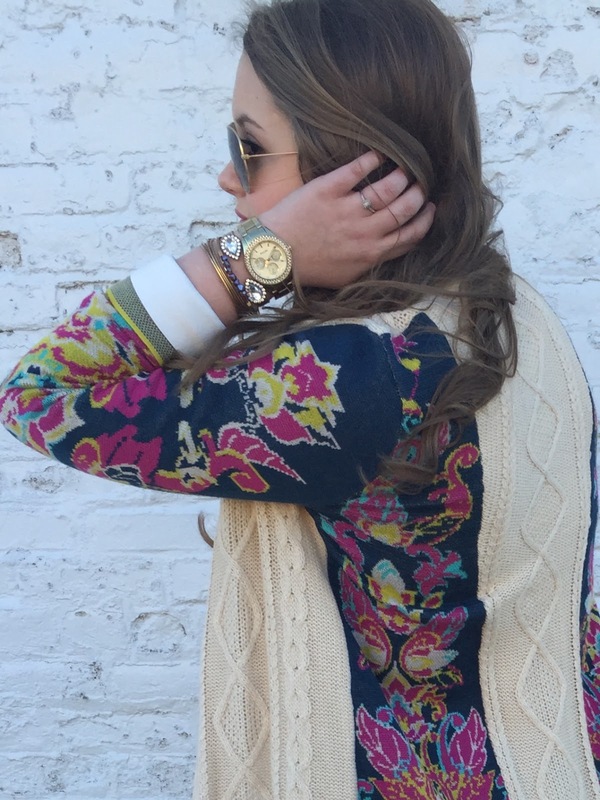 To say I'm in love with this sweater is an understatement, so I'm showing yall two different ways to style it! I love all of the pretty colors and the cable knit!! It's so nice to see bright sweaters in the winter because everything tends to be so dull, which makes this outfit so much fun! I like to switch up my outfits by pairing them with different pieces, and the blue and white plaid did not disappoint! Mixing prints is my favorite! Now let's talk about this white tee.......it is THE best white tee I have ever owned and I promise you will wear it over and over again. It's not too thin that you have to wear something underneath it and it is sooo soft! I own this tee in two other colors and will probably get more! I highly recommend it! And of course, a hat is always a good idea! It's such a fun fall accessory. BTW, this exact sweater is sold out, but I'm linking another fun one!